Well without an authoritative centralized updated source from Blizzard, like an indexed list of all the functions, their features and return values, you rely heavily on the various wiki pages in various states of upkeep. Makes it tough. If you people have an interest in programming though; it is entertaining to work on. And at times being the only thing keeping me playing. I experienced that phenomena with WOW and other other even simpler games such as Kingdom of Loathing. I can try and test to see if the state actually changes and if not, the only thing to do is not to use that function in that way. Other than that, if you want to post your quests.lua file online, I can check to see if there is a typo or something. Well my knowledge of programming is pretty basic, mainly with C and BASIC, and I've forgotten most of what I've learnt of them, and I've never even really looked at LUA before. So trying to look through this code and figure out what is what is a little daunting. As for whether UnitInParty will always return true or false irregardless of the circumstances I don't know. I think 5.0.4 the party mechanics have changed a little. As from what I remember in 4.3 if you're in a dungeon and everyone leaves except you, you are not in a party then. And from what of I've seen of 5.0.4 is if everyone leaves your dungeon group, you are still within an instance party that you can leave. So maybe the game can differentiate between being in a party (even a party of one) and being solo now. But I don't know whether that is true on the LUA side of things and that UnitInParty will correctly return a 1 or a 0, and I don't really have the technical know-how to see if it works now. Well it will not throw an error but it will always evaluate to false/true? UnitInParty("player") should return false. (since patch 1.11.2, always returned 1 before) Use GetNumPartyMembers() instead. Bug: As of 1.11.2(5464), this function returns nil for UnitInParty("player"), possibly due to the function being defined both as a C and LUA function for reasons unknown. If you want to post your updateGroupType function we can diagnose. Sorry for anyone else reading this and you are bored, but hey, learning is fun. and this seems to have gotten rid of my last error, and also seems to have fixed the quest difficulty colour issue I had as well. Now my max level quests are coloured appropriately and not coloured red. BTW thanks for all the help so far! This error means you didn't properly comment out or remove the line with GetNumRaidMembers in it. Message: ..\AddOns\QuestHelper2\main_menu.lua line 164: attempt to index field '?' (a nil value). This error has to do something with applying the texture to the Questhelper button to the main map if you press LEFT RIGHT or MIDDLE buttons on it. Something changed and it doesn't like this anymore. I haven't been able to figure it out yet. You can either live with it, or comment out the offending lines. This will cause the button to not change how it looks off/on but I rarely turn it off and on. if UnitInRaid("player") then group_type = "raid"
If you have a bug that RonnanUK doesn't have you can post it to the ticket system and I can look at it for you. It may get updated by MOP or never. Depends on how the authors feel or if they ever return. 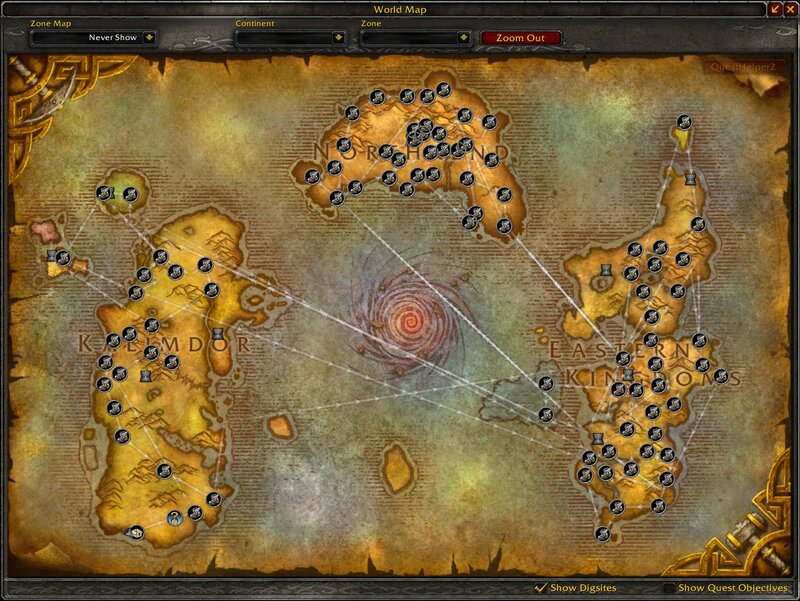 So is this not being updated until the official release of MoP? I'm still doing quests from the previous expansions and it's buggy for me. CreateFrame(): Couldn't find inherited node "UIPanelButtonTemplate2"
Well there is a a few bugs with the 5 patch, and a few you can fix with a few lines. I tweaked it a bit and although buggy; but despite that, it still runs. It don't have the 'new' content and won't tell you MOP quests but hey what you expect. Ronnauk you could probably use it as is. Something breaking on you? Not sure if this'll get read here but seeing as this is pretty much dead, I was wondering if the quest tracker pane can be pulled out from this mod and implemented as it's own addon. I find that Blizzards default one, is just too unwieldy. I like the smaller font, smaller spaces between quests, the ability to move the quest tracker window, and surprisingly, that "thunk" sound when an objective gets completed of this quest tracker.